The developers of Quail Creek subdivision south of Ketchum say they hope to eventually proceed with further construction despite the recent filing of a lawsuit against them to collect $4.7 million in allegedly defaulted loans. Quail Creek, approved by Blaine County commissioners in 2006, was slated to have 87 free-market homes and 39 community-housing units. However, the project has been fraught with challenges—not only the nationwide real estate crash, but also opposition from neighbors and a county affordable-housing requirement that the developer, Clear Creek LLC, argued was too inflexible. In late March and early April 2013, Delaware-based 2010 CRE Ventures filed four complaints in 5th District Court in Hailey against Clear Creek as well as against two of the firm’s partners, Bob Kantor and George Kirk. The complaint states that 2010 CRE Ventures LLC bought three loans from the Federal Deposit Insurance Corp. in 2010 when the FDIC took over the assets of First Bank of Idaho. Kantor and Kirk are being sued for allegedly defaulting on loans made to Clear Creek and for loans made to them personally. The complaint states that the company is seeking a lien on real estate in the Quail Creek subdivision used to secure the original loan. However, it states that the value of the property is likely to be far less than the value of the loan, and Clear Creek should be held liable for the remainder. In 2010, Clear Creek pursued a change in its planned-unit development permit from the county to allow it to donate land to ARCH Community Housing Trust instead of building affordable housing. That request was denied on the grounds that it would violate county ordinance. 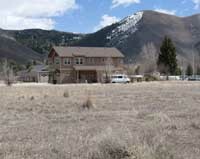 For more background on the proposed Quail Creek development, search “Quail Creek” on our website, www.mtexpress.com.